I’ve been thinking about some of our techniques that we do. They are truly unique from other arts. Most grappling arts concentrate on joint lock manipulation and pain compliance. 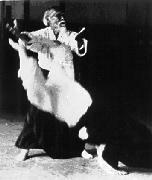 Aikido, having transcended from Daito Ryu ju jitsu has many similar techniques. This evening, we worked on suwari waza (more knee techniques) and variations. I’m still working at about 85% but everyday I feel just a bit better. For this test, I’m trying to concentrate on softness and gentleness. This does not come at the compromise of technique but rather an enhancement to it. It feels good to feel things flowing more and more easily, and it certainly feels good to meet a strike or punch with openness and gentleness. All of these things translate to affairs off the mat; not just conflict situations with bosses, family and friends but also with the ever growing need to expand these relationships and grow them. This entry was posted in Uncategorized and tagged Aikido, First Kyu, Process, Testing by markdeso. Bookmark the permalink.